Well, I have finally said good-bye to my old web-site. It just got too hard and cumbersome to update, revise and re-design with a limiting HTML software package. I don't know how to really do a website so I relied on simple "drag and drop" software provided by the host company. It had LOTS of design limitations and making all the buttons and such was a killer on time. Several years ago my home computer up and died on me. My good friend Doug Hill, managed to revive it long enough to pull files off that were not backed up. I neglected to tell him to back up my files for my website and I was never able to update a version I actually liked. I needed something quick so I threw things together and that was the last version seen. Never managed to re-do it like I wanted to. That's "The Original Series" for the uninitiated. I loved the show growing up and I loved the movies too. I remember my mom crying when Spock died in Star Trek 2! I have a renewed interest since seeing the new movie and this just seemed like the logical thing to do after completing (for now) my Doctor Who series. And who doesn't love Kirk and a green chick???? Joe is gonna be SIX!! Well, it's that time of year where I bust out a picture of Joseph for his annual birthday card. This year he wanted Star Wars! How cool is that!!?? He has also now become co-art director with my wife! He actually got what he asked for tho even if it does mean drawing clone troopers with Darth Vader. You purists out there can settle down tho, this is only for my son. This was more fun than I thought it would be and it went fairly smoothly. 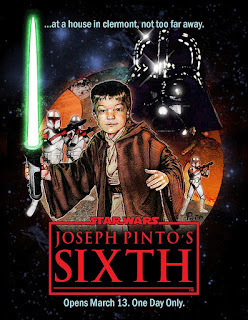 Once I got my references together and a pic of Joseph with his lightsaber, I went to town. The faux Struzan look to it was fun but it doesn't really hold up with the real thing. It only resembles Struzan when you are not comparing it to a real one. So don't! I like it tho. Hope you do. Life seems pretty busy at the moment and I just had to have a painful root canal to boot. It's not like I have not been keeping busy tho, I just don't have much finished work to show today but I figured I should post something since it's been a while and I want to keep the four followers that I have. First, let me show where I am with my Evel Knievel painting. I thought I was done with it but the readers on the ArtRage forum thought that I should continue with the way it was originally intended. I did work a bit more but am now on the fence once more about going further. Maybe some parts unfinished actually add to the piece or I am really just too lazy to keep going. What do you think?? 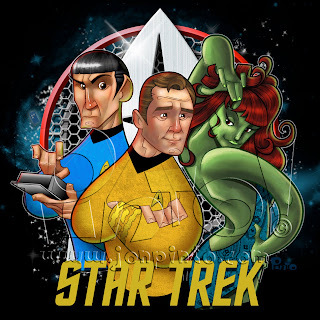 I have also been working on a Star Trek pic done in my style last seen in my Doctor Who series. Not done yet but I relented and thought to show you the mock up with the finished pencil drawings at least. I grew up watching Evel Knievel on Wide World of Sports like lots of kids my age. My brother and I played with those cool toys too! Oh how I miss those! He led quite a life and not all of it good but you have to admire someone who did it on his own terms and I think his heart was in the right place. I started painting this one just before Christmas and recently found it and tinkered with it a bit more before becoming complacent with it. I do really like it but for right now I am content to leave it be in an unfinished state. Plus right after I decided that, I cropped it and (for the moment) think it works better now. I never really know. I have both an early "blocked in" stage with the whole painting and the (currently) final cropped version. All done in ArtRage 3!